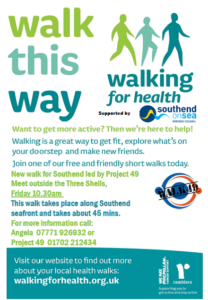 A weekly health walk along Southend seafront lead by Project 49. Everyone is welcome and especially those with a learning disability and their carers. The walk takes approx 45 mins. Meet at the Three Shells cafe.